When Grant Wiggins and Jay McTighe wrote Understanding by Design (UbD) they did what no other educator had ever accomplished: They unequivocally cast assessment in the central role of teaching and learning by making the forceful argument that testing should not be the afterthought of instruction, but the central point of instruction. After all, how do we know students have learned anything after we have taught them if we don't assess them on what we hope they have learned? Since Wiggins helped McTighe write UbD a while ago, I was curious to know how much progress we as educators have made since then. So I asked him. 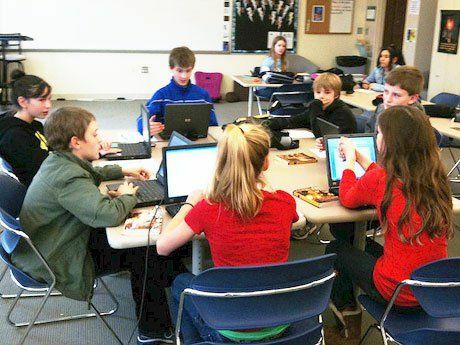 Edutopia: Dr. Wiggins, state assessments have been in the spotlight so much that focus on the regular every day assessments has been pushed to the back seat. We know that the state assessments are a curriculum magnet, (i.e. the standardized assessment encourages the states to match their curriculum with the test) how can teachers use every day assessments to drive the curriculum up from the minimum standards?" Grant Wiggins: Elementary teachers seem to do a much better job of this than secondary. For example, I was just visiting a second grade classroom this morning and I saw that the teacher was able to structure her classroom so that literacy could be better developed through individual feedback. Some students work independently at stations, while the teacher spends time providing critical feedback to individuals and small groups. Such formative feedback is essential to literacy success. In the upper grades, teachers tend to do more whole group instruction than small group instruction and find it difficult to give that critical feedback. Edutopia: What are some ways to get around that difficulty? Wiggins: Some high school teachers use Socratic Seminars to provide students with feedback on their thinking and literacy -- similar to an athletic coach that has to stand on the sidelines while the athletes perform. There are other effective formative assessment strategies such as personal white board paddles and clickers (individual response remotes) that I have seen teachers use to assess understanding at deep levels. Good teachers understand that for students, the mere act of receiving the feedback that they do not know something begins the process of "learning by trying to learn." This reveals the true nature of formative assessment. Edutopia: Teachers could spend all of their time crafting assessments-- making sure that there are questions that challenge each cognitive level, maintaining a culturally neutral vocabulary, designing questions that cover both readiness and knowledge, and matching each question with a taught standard. What is the best way for teachers to keep assessment in perspective with all of their other duties? Wiggins: Formative assessments are not just for the students...the teachers also must have continual feedback to guide their instruction. These assessments do not have to be elaborate. For example a simple exit slip done every day, will reveal the likely misunderstandings and misconceptions that have the may block student progress. A forward-thinking teacher will check for the likely misunderstandings to be able to eliminate them. Some teachers are not good at doing this, but are smart enough to turn to their grade level or content area colleagues for assistance in designing and debugging formative assessments. Edutopia: The topics of formative and summative assessment have been revisited so many times that the terms are starting to lose their effectiveness. How do you help teachers keep them straight? Wiggins: You are correct, many teachers continue to be confused about the difference between formative and summative assessments. Many teachers think of formative assessment in terms of the typical 4 weeks interim test where the questions will never be asked again. This is actually summative. For tests to be truly formative, students need multiple opportunities to be tested on the same information. A formative assessment does not look backwards but it focuses on the present of where the student is right now, it looks to the future. For example an English test. The teacher gives the students six essays, the first five are formative and the sixth is summative, just like in sports every non-conference game is formative, and every other game consist of endless formative assessments that prepare the athletes for the championship game. Summative means there is no opportunity to "re-do", it is for real, like the championship game. Students need this type of formative performance feedback. Let's consider the Common Core sixth-grade content in fractions and decimals. The "Practice Standards" are basically endless formative assessments that lead students to mastery. Secondary teachers tend to think that every thing has to be graded, but non-graded is formative, too. Edutopia: In Understanding by Design, you establish that assessment is intimately involved with planning for effective instruction. It makes so much sense that the expected learning outcomes should first be established in the form of the evaluation, and then be evidenced as the instructional plan is designed around them. What is your take on how well teachers have made the switch from the traditional teach then test to design the test then teaching? Wiggins: Following the concept of preparing the evaluation first (backward design), as proposed in Understanding by Design, is not a natural instinct and teachers are not doing as well as I might have hoped. On the other hand UbD doesn't mean that you have to design the entire assessment before the lesson design, but at the very least you must think about the assessment before you design the instruction. For example, in preparing lessons on Speaking and Listening, in the Common Core. A teacher should ask himself, what will count as evidence of learning? A teacher who originally was thinking on doing public speaking as a more traditional assessment, but when he asks the question, "What will count as evidence of learning?" then he might change his mind and consider Socratic Seminars because they definitely produce a lot of evidence of how much the students have learned simply by tracking their questions and the answers. Edutopia: What is the role of the administrator in regards to testing in the classroom? How can the administrator best support effective assessment? Wiggins: When I visit a class, I have the teacher fill out an "UbD Observation Form" for supervisors. Some of the questions on the form include: What counts as evidence of learning success? What do you want me to look for in this observation? When teachers have thoughtful answers to these questions, the results are easily observable in the lesson delivery. When I talk to teachers about their lesson plans and they do not have a good answer for these questions, this is a warning sign that the teacher will probably need some help in lesson design and this is almost always evident in the observation of the lesson delivery. Administrators can help the teachers focus on how and why they measure learning and especially, they can help teachers to remember to think of assessment in terms of the road to mastery rather than tests or grades. Edutopia: Am I correct in stating that administrators evaluate teacher performance by using authentic assessment strategies like the UbD supervisor form and then they provide critical feedback, similar to what the teachers should be providing their students? Wiggins: That is an insightful question. Yes, administrators should start their evaluations with conversation concerning what counts as evidence of student learning, and what the teacher wants them to be looking for in their lesson, both of which questions demand that the teacher do some effective lesson planning.